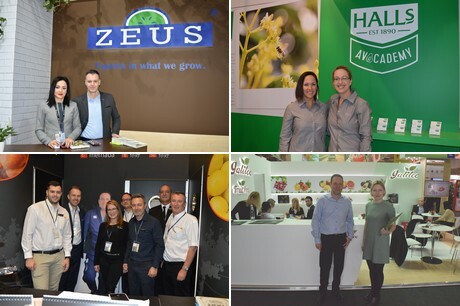 Fruit Logistica 2019 can be summarized in two themes: sustainability and Brexit. Sustainability was featured in almost every stand. The reduction of plastics was high on the agenda, but also restrictions on the use of pesticides. Brexit hung like a dark cloud above the trade fair. Everyone knows the hatchet is meant to fall on March 29. However, the question on everyone's lips is - how hard will it fall and how much damage will it do? The aftermath of the hot summer set the mood among traders. Surpluses on, for example, the European grape market, are affecting traders worldwide. The first day of the fair seemed to be unusually busy. Although the Thursday is normally the busiest day at this trade show, the other two days did not lag much. The aisles were chock-and-block. Traditionally, Friday is quieter. However, this year the stands seemed even busier on that day. Some exhibitors had different opinions though. One of the Belgian exhibitors described the visitors and visitor numbers as "quality above quantity". Standholders from other countries also felt there were fewer people at the fair. Italian exhibitors pointed out that more buyers from the large retail chains would have been welcome. In general, the French delegates were pleased with the trade show. "We made contact with existing clients. Pre-planned meetings also went well", one of the standholders said. According to some of them, there was somewhat of a lack of potential clients. There were also new plum varieties to see, like the COT International's Rougecot and the Lovita. In the machine hall, MAF RODA's Bi-Axone drew attention. This new sorting machine for long pear varieties turns the fruit midway through the process without damaging them. CityCube was the Polish companies' home base. Here, there were mixed feelings. A few exporters had the feeling that there were fewer visitors to their stands this year than last year. Others experienced a real rush on the first day. The Turkish and Moroccan businesses were in Hall 1.1. They enjoyed a good trade show. The Alanar has a massive party with a ceremony on the second day. Thanks to a partnership with a company from Peru, Alanar will be able to supply figs all year round. This was celebrated with a gigantic cake. The Greeks and Egyptians were to be found in Hall 2.1. This hall was bustling during the entire time the fair was on. Business went well here said several companies who traded at this show for the first time. The Greek stands, in particular, went the extra mile and used bright colors to stand out. The Italian delegates showed off a new pavilion, the ‘Italian Fruit Village’ in Hall 7.2a. This pavilion housed many companies, some of which focused on ‘cool agriculture’. Others held the spotlight to tradition and regionality. The Sicilian region chose a new layout. The Vucceria market in the Italian city of Palermo served as inspiration for this. The Puglia region picked the Castel del Monte, a 13rh century castle in the town of Andria as their inspiration. In every Italian stand, there was a lot to sample - from simple, cut products to gastronomical delicacies. In these, color played an important role. There were also cocktails and cosmetic application of the products. Among the exhibitors, companies that have been around for more than 20 years, were unmissable. There were also enough new faces from young companies. Choices need to be made from the long list of potential trade shows. Despite this, Berlin is a must among companies. The three days where many meetings with existing and potential clients can take place is not to be missed. As a cherry on the cake, the Italian company, Jingold received the Fruit Logistica Innovation Award for its Oriental Red Kiwifruit and Canadian CKF, Inc. took home the Bronze Award for its top-sealable compostable, recyclable strawberry punnet. Greenyard's financial woes was the topic of conversation among the Dutch and Belgian standholders. If things go wrong, substantial consequences are expected. It is likely that more companies will buckle. In the Dutch onion trade, Eqraft's is causing a stir. The Dutch exhibitors in Hall 3.2 put a lot of effort into showcasing this. The reduction of plastic is a major issue. A few years ago, this was reserved for companies focused on organic products. Since then, many companies have started using cardboard, pulp, and sugarcane trays and packaging. This change is, in part, due to pressure from the retail chains. This was reflected in the Germans stands. This year, these stands had a clear common theme - sustainability. This is a major factor, especially when it comes to product packaging. According to many, this will become of major importance in the coming years. A new packaging law was recently passed. This means traders are, in a certain sense, compelled to actively combat environmental pollution. They also have to reduce the use of plastics as much as possible. The result is a multitude of experimental and hybrid alternatives for existing packaging flooding the market. These include cellulose, biodegradable plastic, and packaging with air holes or parts made of other materials. All this, to minimize the use of plastics. Most of the Belgian exhibitors could be found in Hall 6.2. Here too, there was a lot of focus on packaging. Plastic slowly has to make way for organically degradable alternatives or cardboard. Sustainability also played a major role among the French standholders. Although, here the focus was not on the packaging per sé. In various stands, the focus was on new 'Zero Résidu de Pesticides' or pesticide-free products. There were also many products with the French quality label, the 'label Rouge'. These labels are of great importance in the French market. They increase consumer confidence. Indian grape exporters were not happy with their new position in Hall 26 at all. The main problem for them was the route people had to take to reach them. For example, visitors had to walk past the South African and Peruvian stand to get to the Indian companies. This means the grape exporters lost a lot of business. This is because the grape importers had often already closed their deals before they reached them. Southern Hemisphere grape exporters are on the lookout for new clients. They are doing so to avoid surpluses that are currently being found on the European market. This is also the case with avocado exporters. South African grape exporters have received access to China. They are looking forward to further growing the market there. The Brexit deadline is looming. Many companies are following this issue with interest and go to meetings. They do, however, admit that, just like their colleagues, they will have to just wait and see what happens. Small wonder then, that is was the theme among the British standholders. British, as well as Irish importers, are calling the whole Brexit, a ‘crazy show’. They do not, however, seem to be genuinely worried. Most of the large companies trust that they have the capacity to manage the changes. The first four post-Brexit weeks will be the ‘tricky period’. This is irrelevant of whether there is a deal or not. In those weeks, the United Kingdom is still very dependent on imports from Europe; Spain in particular. The small traders will have to fit the bill and will have the most extra costs. One trader is said to want to build up stock for that month. This will be to bridge the gap until the British season starts. Other companies are looking for alternative ports. In this way, they hope to minimize waiting times and delays. Irish importers are considering direct routes to the island. They will, then, not have to use the UK as a land bridge. On the growers' and traders' side, things are looking slightly less positive. In the past year, Europe was hit several times by serious, extreme weather. Prolonged periods with no rainfall alternated with extremely high temperatures. This extreme weather, of course, had a major impact on the available volumes and price settings in the trade sector. In Germany, among other things, the potato and onion sector, as well as the outdoor products, suffered from crop failures and quality problems in recent months. Belgian companies specializes in top fruit were less positive. This is as a result of the bad top fruit market. It was, however, striking that those offering red or blush-red pears had a very good season. There is the potential for growth in this segment. The Belgian companies also see Asia and South America as increasingly important sales markets. South African top fruit exporters are also concerned about the supplies in Europe. These exporters have been advised to look for other markets. Click here for the photo report of the North American fresh fruit and vegetable traders.